Chapter XI. Illustration of Passages. “When the interior of man is purified from evils by his desisting from them and shunning them because they are sins, then that internal is opened. which is above the interior’ and which is called the spiritual internal, and which communicates with heaven. Hence it is that man is then intromitted into heaven and conjoined with the LORD. There are two internals in man, one beneath and the other above. The internal which is beneath is that in which man is and from which he thinks, while he lives in the world, for it is natural; this by way of distinction will be called the interior. But the internal which is above, is that into which man comes after death, when he comes into heaven. All the angels of heaven are in this internal, for it is spiritual. This internal is opened to the man who shuns evils as sins. but it is held shut to the man who does not shun evils as sins. This internal is held shut to the man who does not shun evils as sins, because the interior or the natural internal, before man is purified from sins, is hell; and as long as hell is there, heaven cannot be opened, but as soon as hell is removed, heaven is opened. But it should be known that the spiritual internal and heaven are so far opened to man, as the natural internal is purified from the hell which is there; and this is not effected at once, but by degrees successively.”- AE 940. Observe that the spiritual internal in this passage is B with its three degrees and that the natural internal is C; B is called internal in distinction to the whole external, which is composed of C and D together. 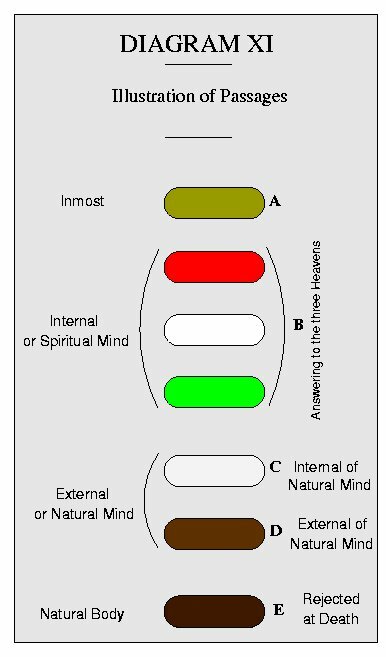 B is also called the spiritual internal in distinction to the natural internal C; C is called the lower internal in distinction to B the higher or spiritual internal. C is called internal in distinction to its own external D (not mentioned in the passage) which is the extreme external of the natural mind and is a thin skin or covering to C, being just within the body and inclosing this natural internal C.
The heaven that is kept shut and cannot be opened till the natural internal C is purified from evil, is the spiritual internal B. Concerning the purification of the natural man “by degrees successively” mentioned in this passage, see Diagrams XXII, XXIII, XXIV. For an illustration of the state of the degrees in the man or spirit in whom “the spiritual internal is held shut” by the prevalence of evil or hell in the natural internal, see Diagram XXV. Another passage is in True Christian Religion, TCR 593. The natural man here considered as two-fold consists of C and D together. The internal natural man is C, and the thin external, covering it as with a skin, is D. The higher or spiritual internal B is not mentioned in this passage but is implied as the spiritual man above the natural man. Read Doctrine of Life 86; (also HH 497-8, 501, 502 ; LJ 56, 69), where “the externals” in which man is said to be while in the world are in the plane D the external part of the natural mind. In these he remains till the time of judgment, in the world of spirits. The “interiors” in these numbers are the interiors of the natural mind C. With the good, “the internals” there mentioned include some one or more of the planes of B. “The devout external” of the wicked, mentioned in Last judgment, 56, proceeded from “the thin skin” of semblances of good and truth just within the body and in the plane of D; “their profane, internal” was in the degree of C. In Last Judgment, 69, the closed interiors” and “the interiors of the evil to be unveiled” are in C. The “seeming heavens,” mentioned in Continuation of Last Judgment, 9, were from the external part of the natural man D; the hells within those seeming heavens, were in C.
From these examples the reader can locate any like “externals and internals” mentioned in Last Judgment or elsewhere in the Writings. A marked example occurs in Arcana Coelestia AC 7046. Here the evil “interiors” are not in the spiritual mind at all but wholly in the internal of the natural mind C. The spiritual internal B, in such cases is closed and almost wholly inoperative. See also Arcana Coelestia AC 6914 where the “bonds” which held the “interiors” in check are in D, the interiors themselves in C.
With this diagram read Divine Providence 100 to 128. The “interiors” or “internals” that are defiled with evil and falsity and must be cleansed that man may be saved, are in the internal of the natural mind here marked C. In C also is the interior will of the Jew, which is adverse to the Christian Religion as mentioned in True Christian Religion TCR 521; his internal mind B being closed, shrunken, and inoperative, like the body affected with marasmus. In C are the “interiors” mentioned in the last sentence of Arcana Coelestia AC 3489 and in the first of Heave and Hell 553; Apocalypse Explained, AE 939. The “internal above the interior” (AE 940) is the spiritual mind B; while the “interior” is C.
“Mere natural good,” the “good done before evils are shunned as sins,” “mere external sanctity and piety,” “good done from self and not from the LORD,” and hereditary natural good “from evil parents” (AC 3469), all have place in the external degree D. These things are inwardly evil, the evil originating in the internal degree C. The “inside of the cup and platter,” (Matt. xxiii, 25) is C, the “outside” is D.